Starbirds is not a game I was aware that existed and therefore I was pleasantly surprised when I stumbled on this vidoe of the game. The game design and coding as well as the music were completed by Sam Jorden. From his website he mentions he always enjoyed playing shoot em games and that he always dreamed of creating a game within this genre but lacked the ability to do everything required to make a complete game, in particular the graphics caused problems. Thankfully in 1993 he met Dario Hardmeier who was skilled in making computer graphics. Together they started working on their own game which was to become Starbirds. Unfortunately the project proved to be a big challenge for them both and the game did not progress as quickly as they both had hoped. Nevertheless, after three years of work, they managed to finish the game and Starbird was created. The game is obviously inspired by horizontal shooters of the time such as Project X and R-Type. The game thankfully doesn't have such an unforgiving level of difficulty which Project X had and experienced shoot em up players should be able to complete this without too much difficulty. This is due to game having four difficulty levels; Easy, Normal Hard and Very Hard for the player to chose from. There is also a two player game option. 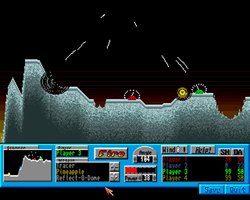 The player can also select different weapons before starting the level. The levels follow a cavern layout. The player can move his ship up or down to choose different routes through the levels. This means that there a lots of different ways that the player can complete the game. There are the usual attack patterns of aliens to destroy as well as the fixed gun placements to avoid or destroy. In total there are four levels and each one is guarded by an extra large boss enemy with big shields and powerful weapons. The crucial question you are probably asking is whether this game is worth playing and the answer is a definate yes. It is one of the best freeware shoot em ups I have ever played on the Amiga. To find out more about the game's back story and the author visit Sam Jordan's website. The game is available as freeware and can be download either from his website or from the link below. I only managed to get the game working on an Amiga 1200 under emulation but it may work on Amiga 500 computers. I will try again and update this information if necessary. One of my favourite Amiga platform games was James Pond II - Robocod. The graphics, animation, music was fantastic and everything came together wonderfully. Starboy was a licenceware game released on the F1 Licenceware label and was clearly been influenced by Robcod. The main character is clearly based on the James Pond character and the use of background stars in the levels are clear references to the Robocod game. Whilst these have been skillfully created you are left with a feeling of regret that the game creators did not spend more time on coming up with their own unique style rather than clone an existing commerical game. By linking their graphics so closely to Robocod the player is always subconciously making comparisions and it is no surprise that Starboy always comes up short in such comparisions. The first level is a good example of how Star Boy fails to live up to its commercial breathen. The level involves flying a plane and shooting a required number of enemies. Whilst the graphics are all drawn to a high standard the actual gameplay is very repetitive and dull for this stage and I almost stopped playing before completing this section. Thankfully I did continue to the second stage and there does seem to be a very sound platform game trying to break out. If only this game had different characters and had its own graphic style it might have made me want to play for longer. Unfortunately due to the many Robocod references I ended up switching off this game and booting up James Pond and spent a good couple of hours playing that game instead. Whilst playing Robocod I also realised that another area found lacking in Star Boy is the lack of in game music. The wonderful in game tunes in Robocod blend so well with the graphics that they add to the game's overall charm. Its a shame that time was taken to add some fun music to the different levels of Star Boy. Overall if you like platform games you may enjoy playing this for a few minutes but it lacks any unique features or charm to make you want to play for it long or to return to it the next day. 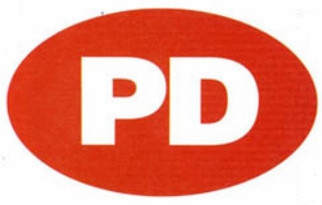 One of my favourite PD games was Tanx. It was a simple two player artillery game for two players where you took it in turns to fire at each other. The winner was the one who managed to get his first shot on target and destroy his opponents tank. It was a simple concept but dangerously addictive and led to many wasted hours for me and my brother in the 1990s. Scorched Tanks takes this simple game idea and takes it to 11. The game oppoenents are increased to include up to four players. These players can be either human or human and computer controlled opponents. The aim of the game is still to destroy the other tanks by shooting at them but instead of just a simple artillery shell the game has upto 70 weapons to choose from each with their own unique style and strength. There is a lava weapon which causes a pool of molten lava to spread out over the land melting everything it is path until the Lava then hardens to form rock. There is also the dangerous Crimson Flood weapon which causes fire and molted brimstone to erupt from the ground five times causing wide spread destruction. The more damage the player causes the oponent the more money the player receives to spend on even more powerful weapons. given. At the end of the last round the winner of the game will be announced and the game will end. The strategy level of the game is increased with the inclusion of sheilds which can protect your tanks from the various weapons. There are 13 different types to choose from. There is an Absorb shield which absorbs damage, a Magnetic shield which deflects incoming missles andthe X-tinguisher which extinguishes any weapon which lands a direct hit and places into the players inventory. As well as lots of weapons and shields the game adds variation by having lots of different worlds to do battle in. The full version of the game contained 6 different worlds. The backgrounds are not just there for decoration and include active elements such as cannons, teleporters and forcefields. There are also weapon upgrades which prove handy during the combat. The game was written by Michael Welch and was originally released as shareware but it has now been made available as freeware and therefore there is no reason for Amiga users not to have played this fantastic game. The game can be download from the Aminet website. A1200, A1500, A2000, A3000, A4000. Any incompatibility problems are usually memory related. The author warns that Running Scorched Tanks from Workbench on a 512K Chip RAM machine may not run properly. It could run out of memory or crash. Overall this is a fantastic multiplayer tank combat game. It is probably best in multiplayer mode rather than single player as it is always more fun mocking a human opponent as you destroy their tank whereas the computer opponent will always respond in stoney silence. The sheer number of weapons and shield options means you will need to complete lots of games before you have worked out the best strategy. If you have never played this game then see the download section below and play it as soon as possible. You will not be disappointed.